The instructions below incorporate my mother’s patented trick to keep taco shells from breaking. Her method allows the juices from the turkey mixture to soak into the shell, which makes it just pliable enough that it won’t crack but not so much that it turns to mush and all the fillings tumble out the botttom. Personally, I like this best as a taco salad so I pounce on any that happen to break (which, thanks to Mom, won’t be many). Prepare pico de gallo: seed and dice tomatoes and jalapeno peppers, combine in medium bowl. 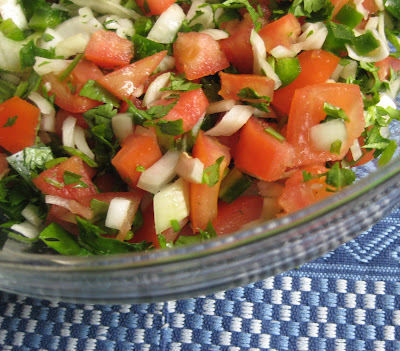 Chop 1 onion and 3 tablespoons cilantro, add to bowl and stir. Salt to taste, and leave flavors to blend while you prepare tacos. Heat oil in skillet over medium high heat, until fragrant. Add turkey and brown (approx. 2 to 3 minutes). Add remaining onions, red pepper and garlic and continue cooking until turkey is cooked through (approx. 3 to 5 minutes). Stir in chipotles, chili powder and tomato sauce. Season with salt to taste, and stir in ½ cup water. Reduce heat to low, and simmer for a few minutes. Carefully remove taco shells from package and stuff with a few spoonfuls of turkey mixture. Place filled shells on cookie sheet, heat in oven for (approx. 3 to 5 minutes)*****. 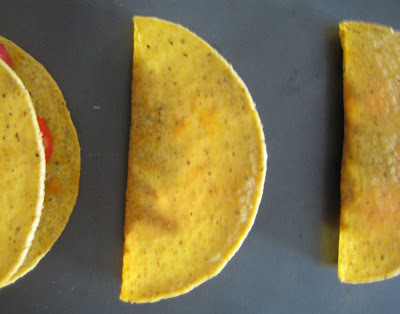 For tacos: arrange filled shells on platter. Serve with bowls of washed, shredded romaine lettuce, cheese, and pico de gallo. 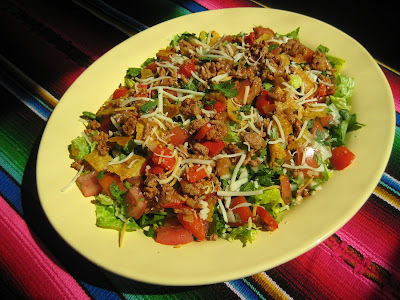 For taco salads: Arrange washed, torn romaine lettuce on plate. Top with pico de gallo, and crumble a filled taco shell over. Sprinkle some cheese on top. * Most packages of ground turkey come in this seemingly odd size, while most recipes call for just a pound. One of the things that I love about this recipe is that it doesn’t leave you with a leftover 1/3 pound of turkey. ** Freeze leftovers for another use. **** For info on storing cilantro, see earlier post. ***** The filled shells keep well in the fridge. To reheat, either pop them in the microwave or back into the oven at 350 degrees. ****** That’s right, Rachael Ray. I understand that there are many who can’t stand Rachael Ray, but I’m a fan. I get that her cutesy expressions can rankle, and her portion sizes are humongous, but I think she gets people in the kitchen cooking when they might otherwise have gone to KFC. And there can be no doubt that that is a good thing. Now if you want to bash on Sandra Lee and that semi-homemade nonsense, then be my guest! Now that's what I'm talkin bout! Yum! Wow. I love your blog, thanks for the price breakdown's. It is so amazing to see what amazing food can be had for so little...especially compared to restaurant prices! YUM! you have such great recipes and so full of color. thanks for a great blog! Sure, I bet it would work with beef. Unless your beef is quite lean, you'll want to drain off some of the fat after browning the beef and before adding the veggies. I am so excited to have found your blog through Foodista! I'm an intern there (and a full-time student, so consequently low on funds) living in an apartment with a tiny kitchen (probably bigger than a Manhattan kitchen, but not huge), and am looking forward to trying some of your cheap, space-conserving eats.